I hope you'll forgive me today and allow me to take a break from Football. We do something like this three times a year when we send a non football email. This is one of those days as we take a day to remember those who have died in our nation's service. Memorial Day is a big weekend as it's the kickoff to summer but it's also a time to remember the folks that have served our country. If you know someone who's lost a friend or family member that's served, I can tell you that taking 10 seconds to say thank you is a fantastic time investment there. And if you happen to be in that (huge) group of folks that have lost someone, we want to say thank you to you from all of us at Footballguys. We get to do what we do because of the sacrifices made by a great many others. And thank you to all you Veterans out there. We owe you. As I've done in year's past, I'm including a picture that's stuck with me for a while now. It's from a fantastic group of powerful photographs covering different topics from Boston.com. Please note that some of the photos are graphic. The caption reads, "Phillip Serwinowski (center), father of Lance Cpl. 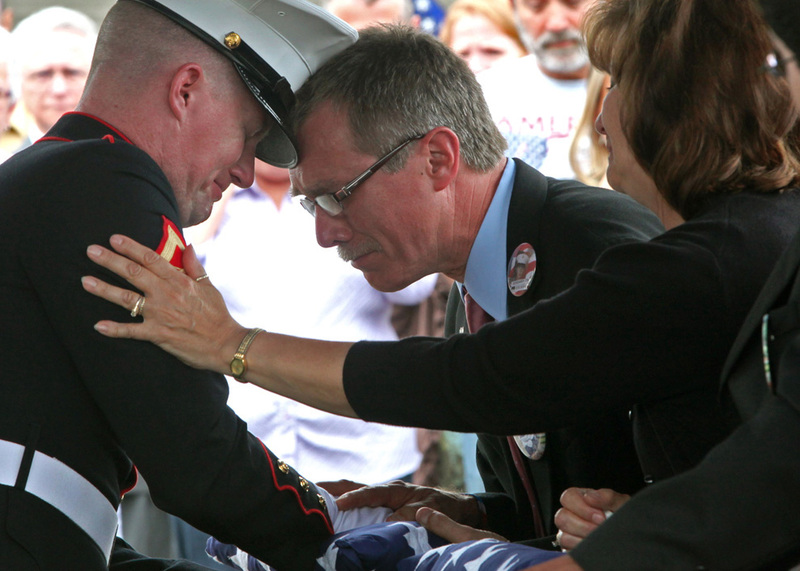 Timothy G. Serwinowski, rests his head on the forehead of Marine Lance Cpl. Nathan McCormack of Garden City, Michigan as he presents the flag to the family outside Amigone Funeral Home on Sheridan Dr. in Tonawanda, New York on Saturday, June 26, 2010. Serwinkowski's mother Sally Urban reaches out a supportive arm to the visiting marine who served in the same platoon as her son and escorted the body home after his death." I don't know the Serwinkowski family at all. But I don't think I need to in order to see the feeling here as this is one of those pictures that speaks a great many words. And please, this isn't about politics. This is about families and friends like the Serwinkowskis that have lost someone important. And it's about our gratitude towards those folks. I don't mean to be a downer here. But there's more to this day than barbecue and beaches. Lots and lots of our folks have made an incredible sacrifice that enables us to enjoy a great many things we take for granted. We are thankful. Thanks you Veterans. And thank you Family and Friends of Veterans. We'll see you tomorrow as we get back to Football.